There is something sublimely awful about the 'bird's nest' stadium which hosted the protracted opening ceremony for the Beijing Olympics. The nest motif reminds us of the delicacy and sensitivity to the forms and rhythms of the natural world which are such a strength of so much traditional Chinese poetry, painting, and architecture. 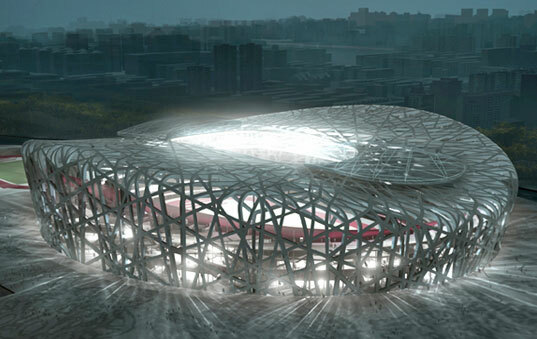 The size of the stadium, though, makes a mockery of the motif - one imagines a flock of Apache helicopters or one of Darth Vader's ungainly black patrol ships alighting from the nest, instead of the graceful birds of T'ang dynasty poems. In much the same way, the opening ceremony diminished the event it was supposed to celebrate. The militarised yet absurdly sentimental spectacle was a sort of nightmarish fusion of a Stalinist mass rally and a Disneyland film, and thus undoubtledly appealed to the corporate 'communists' who have run China since D'eng Xiaoping rose to power at the end of the '70s. It was a relief when the Olympic athletes were finally allowed to enter the stadium, and their unscripted ebullience went some way towards the salvaging the night. New Zealand has a rather different design tradition from China - where the architects of the Middle Kingdom have a reputation for gracefully harnessing chi, we have always been a nation of proudly rough and ready shed builders. And the new, Olympic-sized Westfield Albany megmall on Auckland's North Shore mocks our noble tradition just as surely as Beijing's bird's nest mocks the work of Chinese aesthetes. Where the bird's nest blows a traditional Chinese motif out of all proportion, the mall at Albany takes the good old-fashioned Kiwi backyard shed and blows it up into a Ballardian nightmare. The smell of chemicals, the absence of windows, and the headache-coloured walls might seem charming when you're visiting the place where your mate stores his homebrew, or tinkers with his motorbike, or paints her masterpieces, but they quickly become oppressive when you're hundreds of metres away from the nearest egress, and desperate for a breath of fresher air, or simply for some proof that the outside world has not ceased to exist. In John Boorman's essential but half-forgotten film Zardoz - it's the one where Sean Connery runs around for three hours in a red jockstrap playing a character called Zed the Destroyer - a utopian society of immortals ages its artists and dissidents until they become senile, and forces them to live ad infinitum in a dilapidated old folks' home in the middle of the woods, where they pass time by playing in a shambolic brass band. 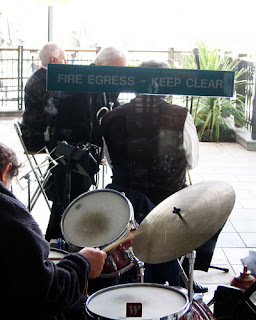 After gratefully discovering an fire exit at the back of the giant shed at Albany, I came upon a brass band of old men playing to a non-existent audience. Something in their bearing reminded me of the band in Zardoz. I forgot my desire to flee far from the mall and hung about for half an hour, thinking, for the first five minutes at least, that the band was tuning up, and that a crowd would soon gather to applaud politely and drop useless ten cent pieces in a tattered tophat. Nobody appeared, though, to keep me company in the audience. Even more strangely, perhaps, no member of the band ever made eye contact with the sole member of the crowd, even when he began taking photos. The band did not pause for a moment between its songs, which sounded to my inexpert ears like frayed and over-long versions - strictly instrumental, of course - of minor Brat Pack hits from the late 1950s. I also thought I heard the theme from Dad's Army at one point. When I finally fled the scene, it was out of an obscure sense of embarrassment, rather than mere boredom. Why do these old men play? Who, if anyone, pays them? Are they performing some strange penance? Do the owners of the monster shed pay them to perform outside an obscure fire exit where no sensible person ever loiters, simply so that twenty-first century capitalism's contempt for all artists and all aesthetic standards can be celebrated? Has anyone else seen the old men play? Were my camera and I merely hallucinating? I love how the surreal experience comes out of nowhere at the end of this post. Also,although totally expected, the opening ceremony really did skip from Zheng He to 1979 in the "historical section" with the exception of playing a segment from the Yellow River Cantata, perhaps. Representations of Confucianism, Taoism and Buddhism, but not the big other, besides the name of the organization putting on the show. I also thought, "At least the Zheng He bit won't upset Maps with an interpretive dance regarding Chinese explorers landing in Aotearoa". Although it only means new, and more fitting, clothes, I wonder if the Communist Party of China will find a way to fully let go of that past. Another thing was that although every nation ramps up the "harmony" ideology when it comes to the Olympics, it seems to be the prevalent theme in official Chinese discourse, and the ceremony openly put that as the ceremony's theme, along with the additional underlying message to Chinese people that "harmony" means obedience, which made me think again of Mao. I have yet to reach a conclusion about the Mao period in China (I would say my opinion is negative mixed with sympathy for socialist goals and a deep dislike of anti-Communism), but when it comes to what Mao said I marvel at how revolutionary it must have seemed in Chinese society and how thickly the current government/party has to abjure it. To tell people it is right to rebel against reactionaries, to be against the traditional sense of order and harmony and to "bombard" the headquarters of the party. Of course, this was coupled with a cult of personality, the traditional concept of bypassing corrupt local official for the righteous and beneficent emperor and the suffering and brutality as the Cultural Revolution progressed. Mao may have helped instigate it out of heavy self-interest in his personal power, but its surface anti-authoritarianism and anti-traditionalism is deeply striking in the Chinese context. Russia – Chechnya - 1800- ? I once saw these men playing in Orewa, outside an English themed pub. Not too sure who they're running with (or from) but they played 'The Grapes of Wraith. Nice comment, Nathaniel. I've asked Michael Arnold what he thinks of it. Modern China is powerfully informed by Maoism [but by that I mean it was "informed" or formed primarily by its great struggle against Japan that was also a revolution like that of the US Revolution which was also a war of independence against or from Britain] AND the Cultural revolution (which partly in practice and in theory was very important historical event* (Mao's call to rebel being quite correct - the need for the people themselves to take control, an effort to vitalise socialism from its normal course of Sate Control and then corruption and degeneration to individualism selfishness greed capitalism and thus Imperialism as happened very rapidly to the USSR, which became "rotten" very soon after the 1918 putsch etc - human greed and ambition - even while Lenin was in power...) - and a lot was learnt - there was indeed great leap (or leaps of various kinds) - BUT - the country could not be run by one power or idea or ideology (much less one person such as a Mao - after all the idea of communism is to get the people -not individuals - to run things - Mao was aware of this - he and Chu Teh struggled (perhaps hopelessly) in the end (Joyce talks of the "gratefully oppressed" in Ireland)) against peoples' tendency to symbolise the revolution into one person or thing or one image (many peasants used to refer to a Chu Mao as their leader when the war of liberation was going on during the 2nd W War) - the struggle is to depart from one "great helmsman" - the problem - to reiterate - is that humans seem to need - always - helmsmen, leaders - so a Mao or whoever would have been invented if China didn't have one. So, indeed, thus China was "informed" and formed also by Marxism but also by its very long and indeed often rich history and its culture. But Maps is (or will be) getting sad and old himself, like those old (real or imagined) men (who sound like they might be the band that was in "The Prisoner" escaped from surrea1 1967 television and somehow reaching NZ...) he "saw" (?) playing in a band - he has it in for old people such as this old Richard - but he too will get old and disappear one day! And Phelps the Superman (some new drug he is using?) - he will grow old and die of cancer or something one day. I should wear the bottoms of my trousers rolled."